Welcome to IT Hyperstore Online Malaysia web site online store. Terms and conditions stated below applies to all visitors and users of IT Hyperstore. You're bound by these terms and conditions as long as you're on www.ithyperstore.com. It is your responsibility to make sure that your order contains acceptable and approved items for import into the country of destination/delivery. The buyers solely accept the full risk of any package (or part thereof) being detained by customs for whatever reason and acknowledge and agree that they will not hold IT Hyperstore liable for such packages, for whatever reason being unable to be delivered to their destination. Your Conduct and Use Limitation - You shall not carry out any act or omission or procure any act or omission which would: (a) disrupt, impair or interfere with, alter or modify this website or its software; (b) act in a way that affects or reflects negatively on us or anyone else; (c) collect or attempt to collect any information from others including, without limitation, personally identifiable information, without such party's prior consent; (d) engage in any activities in such a manner as to expose IT Hyperstore or any third party to liability or adversely affecting the name, reputation or business of us or any such third party; (e) commit a crime or in the course of committing a crime or for an unlawful purpose to do any act that may damage the network or systems or cause the quality of IT Hyperstore to be impaired; (f) violating or attempting to violate the security of the website; (g) Cause any illegal, offensive, defamatory material to be placed on or associated with this website; (g) b in breach of any copyright, trade mark, privacy, confidence, or any other third party right; (h) cause any inconvenience to IT Hyperstore, its employees, servants, agents, software and other suppliers or any other third party (including, without limitation, creating or procuring software viruses, chain letters, unsolicited communications and 'spam'). NOTE: Violations of system or network security may result in civil or criminal liability. Occasionally, one of the products you have ordered may be out of stock. If this happens, you will always be emailed with the option for you to cancel your order or change your order should you prefer not to wait. You must therefore provide us with your e-mail address when ordering. If you decide to wait for an order, please be aware that you may have to wait longer than the delivery schedule times stated above. IT Hyperstore may make changes to any products offered at IT Hyperstore, or to the applicable prices for any such products, at any time, without notice. The information provided at IT Hyperstore with respect to products may be out of date and IT Hyperstore makes no commitment to update the information provided at IT Hyperstore with respect to such products. Every effort has been made to reflect product colours as accurately as possible. However, due to differences in monitors, we are unable to guarantee that the colour you will see on your monitor will accurately reflect the true colour of the product. All drawings, photos, descriptive matter, specifications and advertising issued on this website are issued or published for the sole purpose of giving an approximate idea of the products described in them. They will not form part of the contract with you and no warranty or guarantee shall be expressed or implied in the contract with you in this regard. The customer who purchases the products is responsible for paying these customs rights, and of the possible paperwork involved. The price of the products sold is in USD and it doesn't include taxes (VAT). Customers are required to keep close track on their packages. If there is any delay in receiving a package, you will need to contact the designated courier services agency or immediately inform IT Hyperstore in order to ascertain the reason for the delay. We know of no documented cases of credit card fraud using our shopping system over the Internet. All credit card numbers are encrypted in the software when the order is placed using 128 bit encryption. They are only decrypted after they reach our system. They are not held in clear text on any web site. 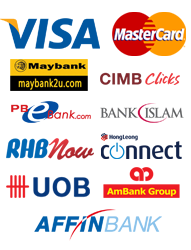 We process payment by credit card through eGHL. We currently only accept Ringgit Malaysia and US Dollar and shall accept RM as the official currency for all calculations. POS LAJU, GDEX, SKYNET, TAQBIN, NATIONWIDE, DHL, FEDEX, UPS and USPS will only cover the actual goods value if the package is damaged by the shipping agent during the transporting of your goods. (We would not be held responsible if you've requested for us to change the invoice value). You are required to make a report to us on damaged item(s) in your package within 24 hours after you have received the package. We will not entertain any request if more than 24 hours after you have received the package. We shall endeavour to deliver your order within 1 - 7 working days upon successful payment confirmation unless otherwise specified. You should be able to receive your order within 3-10 working days (excluding Saturday, Sunday or Public Holiday) after shipment date, depending on the shipping courier you have chosen. IT Hyperstore is committed to ensure that your orders are delivered to you safely and on time. Therefore only the authorized receiver shall be permitted to accept the delivery. Please make sure that the authorized receiver is present to make the authorized signature. IT Hyperstore reserve the rights not to release the delivery in the absence of the authorized receiver. IT Hyperstore is making every effort to deliver your order within the time stated. However, due to certain unforeseen circumstances, slight delay in deliveries might occur, IT Hyperstore will not be liable for any loss caused to you by late or delayed delivery. In the event if your package is lost by the shipping courier and your package has not been insured, we will only replace the lost products with the amount that is declared on the invoice according to your request. THIS SITE IS PROVIDED BY IT HYPERSTORE ON AN "AS IS" AND "AS AVAILABLE" BASIS. IT HYPERSTORE MAKES NO REPRESENTATIONS OR WARRANTIES OF ANY KIND, EXPRESS OR IMPLIED, AS TO THE OPERATION OF THE SITE OR THE INFORMATION, CONTENT, MATERIALS, OR PRODUCTS INCLUDED ON THIS SITE. TO THE FULL EXTENT PERMISSIBLE BY APPLICABLE LAW, IT HYPERSTORE DISCLAIMS ALL WARRANTIES, EXPRESS OR IMPLIED, INCLUDING, BUT NOT LIMITED TO, IMPLIED WARRANTIES OF MERCHANTABILITY AND FITNESS FOR A PARTICULAR PURPOSE. WITHOUT LIMITING THE FOREGOING, IT HYPERSTORE DISCLAIMS ANY AND ALL WARRANTIES, EXPRESS OR IMPLIED, FOR ANY MERCHANDISE OFFERED ON THIS SITE. YOU ACKNOWLEDGE, BY YOUR USE OF THE IT HYPERSTORE WEB SITE, THAT YOUR USE OF THE SITE IS AT YOUR SOLE RISK. THIS DISCLAIMER DOES NOT APPLY TO ANY PRODUCT WARRANTY OFFERED BY THE MANUFACTURER OF THE PRODUCT. THIS DISCLAIMER CONSTITUTES AN ESSENTIAL PART OF THIS AGREEMENT. Every effort is made to ensure your satisfaction at IT Hyperstore. If you are not happy with our service or product, please contact us and we will do our best to sort out the problem. You agree to defend, indemnify and hold harmless IT Hyperstore and its affiliates from and against any and all claims, damages, costs and expenses, including attorney's fees, arising from or related to your use of this site. In the event that you breach any of these terms, you will indemnify and keep indemnified IT Hyperstore, its subsidiaries, associated companies, employees, servants, agents, professional advisors, suppliers and affiliates from time to time against all damages, losses, claims, costs, charges, awards, orders, judgments and other liabilities suffered or threatened as a result of a breach of these terms and conditions. To the extent permitted by law, all sales at IT Hyperstore are governed by Malaysia law, without giving effect to its conflict of law provisions. IT Hyperstore is not liable for any direct, indirect, special, incidental or consequential damages arising out of the use or the inability to use, the products on this site. This include but is not limited to the loss of data or loss of profit, even if IT Hyperstore was advised of the possibility of such damages. IT Hyperstore may contain links to other Internet sites ("linked sites"). IT Hyperstore does not assume any responsibility or liability for communications or materials available at such linked sites. These links are provided merely for your convenience. You are solely responsible for understanding any terms and conditions that may apply when you visit or place orders with the linked sites. You are never under any obligation to purchase anything at the online shop, so feel free to browse the products on sale. If you decide that you would like to purchase a product, you can do so easily! Simply click on any products that you wish to buy and put them into the shopping cart. After you have finished with your selection, click on Checkout and you will be asked for a few details before we proceed to satisfy your order. It's as simple as that! (1) If any of the aforementioned terms are held to be invalid or unenforceable pursuant to applicable law including, but not limited to, the warranty disclaimers and liability limitations set forth above, then the invalid or unenforceable terms will be deemed superseded by a valid, enforceable provision that most closely matches the intent of the original provision and the remainder of the terms shall continue in effect; (2) IT Hyperstore's failure to insist on or enforce strict performance of these terms shall not be construed as a waiver by IT Hyperstore of any provision or any right it has to enforce these terms, nor shall any course of conduct between IT Hyperstore and you or any other party be deemed to modify any provision of these terms. You are required to report missing item in your package within 24 hours after you have received the package. We will not entertain any request if more than 24 hours after you have received the package. IT Hyperstore reserves the right to do any of the following, at any time, without notice: (1) to modify, suspend or terminate operation of or access to IT Hyperstore, or to any portion of IT Hyperstore, for any reason whatsoever; and (2) to interrupt the operation of IT Hyperstore, or any portion of IT Hyperstore, as necessary to perform routine or non-routine maintenance, error correction, or other changes. Unless otherwise specified for particular products, we shall refund you your payment if you decide to cancel your orders within twenty four (24) hours after your order has been confirmed and prior to shipment except for the transaction fees charged by the credit card company which is non refundable. If you decide to cancel your orders twenty four (24) hours after your order has been confirmed and prior to shipment, we shall deduct a minimum of RM 50.00 from your payment as administrative fees in addition to the transaction fees charged by the credit card company. The balance after deduction of the administrative fees and the transaction fees will be refunded to you. ONCE YOUR ORDER HAS BEEN SHIPPED YOU ARE NOT ABLE TO CANCEL YOUR ORDER. WE WILL NOT REFUND YOUR PAYMENT EVEN IF YOU RETURN THE PRODUCTS TO US. All the products were in stock when your order was confirmed, but after your payment was confirmed, one of the products in your order went out of stock. In this case we will ship all the in-stock products that you have ordered first and for products which are out of stock, we will ship it to you immediately once the next shipment of stock arrives or we will refund to you for those items out of stock. The product was already out of stock when you made the order. In this case we will ship all products in the order only when the new stock for the out of stock product arrives However, in some situations we might ship the products that are available first. IT Hyperstore accepts various payment method options. Click here to view the list of acceptable payment methods. Orders will be charged packing and post based on the weight of the order. Packing and post costs will be added to your order total. Please note that due to varying size and weight of our products, and different postage rate to each country, the postage and packing costs will be calculated on an individual basis. Once your package has been shipped out, we shall not be held responsible/liable if any of the products are missing or damaged during shipping. IT Hyperstore recommends that you insure your packages and declare the full value of the shipment so that you are completely protected if the shipment is lost or damaged in shipping. Please check your delivery address carefully as we will not be responsible for delivery to an incorrect address. The customer shall be responsible for the cost to resend a package that is returned because of an incorrect address. If you have instructed us to create a lower value invoice for you and in the event that the parcel or package is lost during shipment, POS LAJU, GDEX, SKYNET, TAQBIN, Fedex, DHL, UPS or any shipping agents shall only compensate on the lower invoice value for your order that you instructed us to put. We reserve the right to put whatever amount of this order value in the shipping invoice if there is no request to change the order value or even if you have state an order value for us. We do not entertain request for shipping packages in multiple parcels. We may immediately issue a warning, suspend or terminate your use of IT Hyperstore and deny your access to all or part of the website or refuse to provide our services to you without notice if: (1) You are in breach of any part of the terms; (2) We believe that your actions may cause legal liability for us, you, or any other user.